The Hurricanes reached 20 points with the triumph. Hobart Hurricanes have managed to finish the round-robin stage of this edition’s Big Bash League (BBL) atop the points table. The team, captained by Matthew Wade, came to the party and defeated Melbourne Renegades by 16 runs at the Bellerive Oval. The Renegades, on the other hand, have nothing to worry about despite the drubbing as they have already qualified to the subsequent round. The visitors’ decision to bowl first backfired on them as the Hurricanes racked up 183 for six in 20 overs. D’Arcy Short and Wade took their team off to a blistering start with a partnership of 87 runs from 51 balls. The latter was the more aggressive of the two and he notched 58 runs from 30 deliveries with six boundaries and six sixes. Fast bowler Kane Richardson broke the ominous-looking stand. In the same over, the speedster nipped out Short as well. Mohammad Nabi accounted for the wicket of Caleb Jewell to pick up the third Hurricanes’ wicket. George Bailey fell prey to left-armer Harry Gurney for nine. However, Simon Milenko and Ben McDermott scored 27 and 37 respectively to propel the hosts’ score. Even as Richardson and Gurney got two wickets, Nabi and Daniel Christian got one each. Aaron Finch took the Renegades off to a flying start and he built a stand of 37 runs from 20 balls with Marcus Harris, who could only score three before being dismissed by Jofra Archer. Leg-spinner Qais Ahmed got the dangerous Finch, who threatened with 35 from 28 with six boundaries. Short removed Sam Harper, who didn’t die wondering with a brief, yet effective knock of 20 runs from 12 balls. Nabi became Short’s second victim. The Renegades lost wickets in heaps in the end and subsequently, fell behind the 8-ball. Mackenzie Harvey spanked a couple over the ropes to score 15 runs, but even he couldn’t carry on. Christian also tried his heart out with 15 runs off 18 balls. Unfortunately, their efforts went in vain. Archer, Short and Qais turned out to be the most successful with two wickets apiece. #BBL08 Why isn't Matthew Wade in the ODI squad? So what has Matthew Wade done wrong to not be getting a gig in some format for Australia? Not even in a squad! You literally cannot punch the door harder than Matthew Wade has over the past 12 months. It would be interesting to hear from the NSP what more he needs to do to be at the World Cup in a few months. Matthew Wade and D Arcy Short are in form of their lives. If only they can take their this form for the Australian cricket team. Also, the way the duo have dominated the bowlers throughout the BBL, I hope they do not choke in the knockouts. 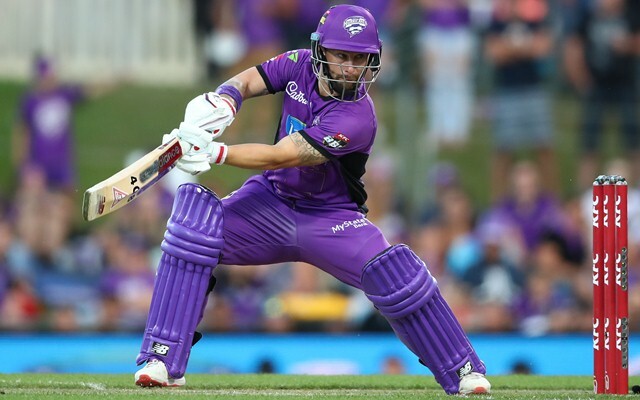 Matthew Wade top scores for the Hobart Hurricanes as they beat the Melbourne Renegades by 16 runs.